Like the Weeping Angels of Dr. Who lore, SOMER Blink seems to change position and shape whenever you do not keep your eyes on them. Less than a year ago, cries about favoritism rose from the community when CCP gave them the Ishukone Watch Scorpions and proposed to make previously “lost” ships, like the Guardian Vexor, available as Blink prices. The scrutiny SOMER Blink received back then resulted in the uncovering of what looked like a real-money-trading (RMT) scheme that was going on in the background. SOMER Blink offered Blink Credits worth ISK to everyone who bought a Game Time Code through their affiliate Markee Dragon. Via that referral, SOMER Blink got a percentage cut of every GTC sold that way. Through this proxy, they received money and gave out ISK. In very simple terms that is the definition of RMT. While this might have been a first for SOMER Blink, Markee Dragon had previously been involved in RMT schemes as investigative journalist Noizy Gamer found out. The outcry from the community resulted in CCP taking action and ordering SOMER Blink to shut the system down. Back then SOMER Blink quietly conducted their business in a don’t-ask-don’t-tell manner with only an implied consent from CCP. After all, Reykjavik supported them as a trusted community lottery site, so what they did must have been alright. Even Noizy Gamer – a dedicated watcher of all things related to illicit RMT – did not spot it right away. CCP clearly did not take the time either to examine what was going on until it became an issue of public debate. SOMER Blink has since suffered in popularity, but retained their position of CCP affiliate, along with Markee Dragon, and kept sponsoring many community sites and events. Now a new scheme has come to the attention of the ever watchful EVE community. For the clearest explanation on how that works, I would point to our esteemed colleagues at another news site. Nosy Gamer also revisited the issue with his usual diligence. 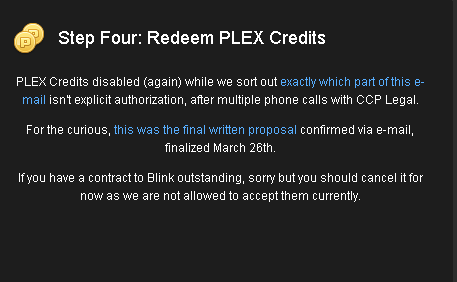 (image courtesy of Funky Bacon) The program does not stop there however: SOMER Blink are offering to buy PLEX at their markup price for old Blink Credits as you can see in this conversation from the public in-game channel SOMER Lotteries (Aisylia Park is a SOMER Blink member, emphasis is mine). Torin Nazimar Jaynara > basically you buy plex in jita then contract it to blink? get money back? Macsadbro > Let me get this straight… People buy GTC from Markeedragon -> Blink gives you a credit -> Can use this credit to sell a plex to Blink? Torin Nazimar Jaynara > so can you get double the isk by redeem and sellin to blink? Torin Nazimar Jaynara > correct? Amid fervent speculations, CSM members Funky Bacon, Sugar Kyle, Sion Kumitomo and Xander Phoena released their own statements. So did CCP Falcon, head of the community team. You may not publish private communications from CCP, their agents or representatives or EVE Online volunteers without authorization. Aisylia Park > Did you enter the reference code? Aisylia Park > What did it tell you? Aisylia Park > Hm, but you are showing no Plex credits on that page? Aisylia Park > So on the GTC page in step 4 you dont see any credits? xxCEOxx > You’ve already claimed this GTC. If you buy your codes through Markee Dragon, we’ll auto-link your Blink account, so this may be what’s happening. Please contact support if you need help! It is not yet clear what exactly is going on here. CCP Falcon openly said in his statement that he is against the practice in effect. Probably others in the Reykjavik office share his opinion, but at least one other person inside CCP was aware and consented – Lisa Bell-Cabrera, Vice President of sales. According to their own statements, SOMER Blink are in the process of talking to the CCP legal team. Despite the announcement of Lisa Bell-Cabrera during her exchange with Somerset Mahm, that she will submit SOMER Blink’s proposal to the legal team, it looks like they have not been consulted about this by sales, or at least have not given explicit approval. According to CCP Falcon “This was not authorized by CCP’s legal department”. The statements of CCP Falcon indicate a probability that there is now a heated internal discussion taking place at CCP. It looks like they have already taken steps behind the scenes to stop the PLEX Credit program. According to CCP Falcon “some temporary action has been taken in order to keep a handle on the situation.” At the time of publication, the SOMER Blink website has been updated, announcing that the “GTC bonus is inactive, as per CCP request” While this drama is unfolding, some people wonder what it all means for them. Is there even a reason to be concerned about all this? Why is this even wrong? 10. You may not market, sell, advertise, promote, solicit or otherwise arrange for the exchange or transfer of items in the game or other game services unless it is for in-game sales of in-game services or items. 11. The advertisement or sale of out of game goods and services not directly related to EVE online is prohibited. The only out of game goods and services which can be advertised or sold are the following: EVE forum signature creation, website and third party voice communication server hosting or EVE Time Codes. Accounts may not be used for business purposes. Access to the System and playing EVE is intended for your personal entertainment, enjoyment and recreation, and not for corporate, business, commercial or income-seeking activities. Business entities and anyone who is acting for or on behalf of a business or for business purposes may not establish an Account, access the System or play EVE. Accessing the System or using the Game for commercial, business or income-seeking purposes is strictly prohibited. Somerset Mahm is the in-game account of the person running SOMER Blink however. In light of the quoted regulation, that could already be construed as a EULA violation. 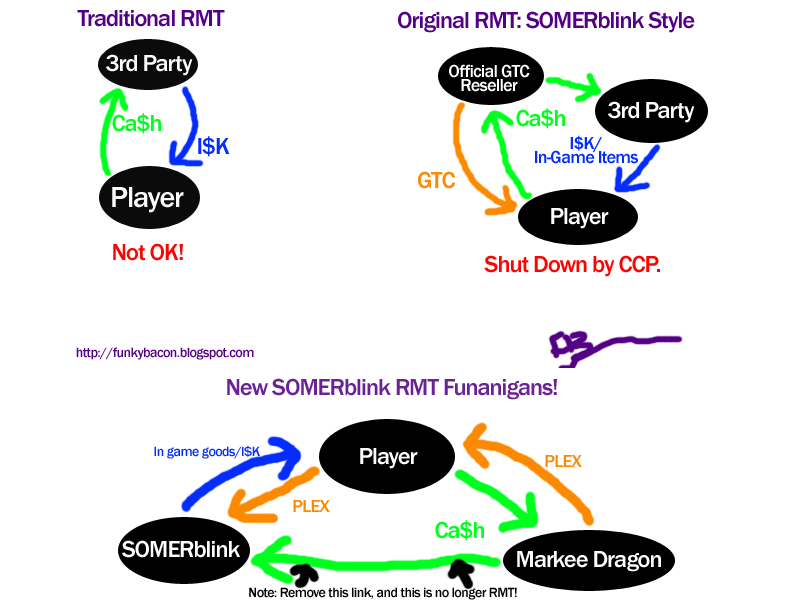 Some people are already speculating that CCP has become too dependent on resale revenue generated through the SOMER Blink/Markee Dragon scheme. The speculation is, that this is the reason why CCP have allowed it to happen in the first place. Right now, that is pure conjecture, but if other resellers were pushed out of the market, this scenario could become fact. A monopolist reseller would be in a position of too much power, and in the end that can not be beneficial for the customers or CCP. On top of that is the overarching issue of fairness and transparency. If CCP legal and sales are allowing SOMER Blink and Markee Dragon to conduct such trades, it would be appropriate that they make that option public through the conditions of their reseller and affiliate program. Other people who work as resellers or with affiliates could then make similar offers if they wanted. 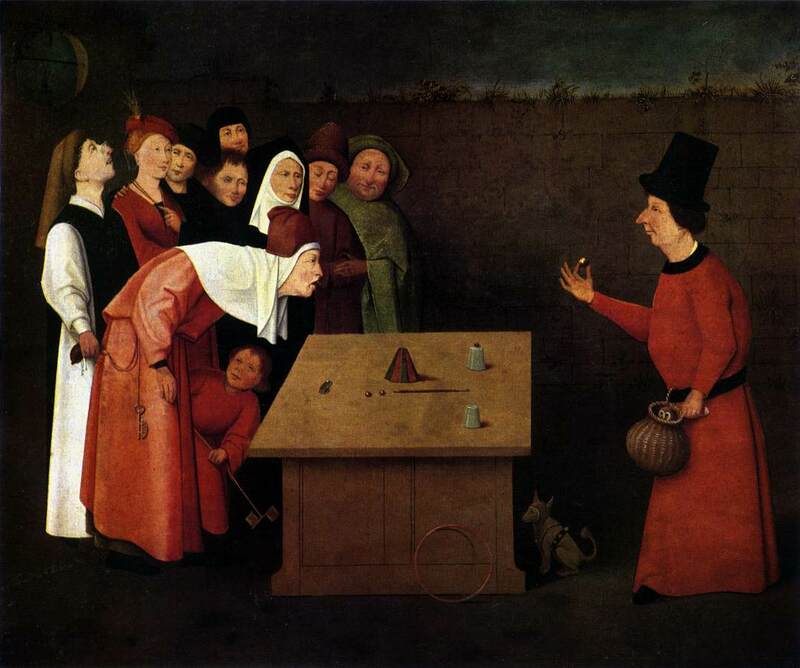 As long as only one business is given that permission without any further comment, the accusation of favoritism stands. Considering the fact that even within CCP there appears to be disagreement about that program, it is not quite fair to say that there is preferential treatment for SOMER Blink from the company as such. However, yet again there is evidence of lacking communication and unclear statements from CCP, and that causes vocal reactions from the community. This time the communication problem even affects relations within the company, as is evident by the statement of CCP Falcon that “the community team was not aware of this until I was contacted by the CSM in the middle of the night on Sunday.” The question has to be asked whether any lesson was learned at all from the last time SOMER Blink was at the centre of a scandal. Update from the editor: SOMER Blink have released a statement today that they will be going on long, possibly infinite, hiatus. They maintain the position that they were acting within the directives given by CCP and that the company has “thrown them under the bus”, creating a “hostile environment” that they do not wish to work in. You can read the full statement on the SOMER Blink website.